Raman peaks in emission spectra - The fluorescence laboratory. In emission measurements Raman peaks come as a result of inelastic scattering of the incoming light from the solvent, also known as Raman scattering (or Stokes scattering if there is a loss of energy). Raman scattering occurs from all solvents and the shift between the excitation wavelength and the Raman peak is always a constant amount of energy. As a result, peaks resulting from Raman scattering shift spectrally when changing the excitation wavelength, which can be used to identify the Raman peak. The shift in energy between the excitation wavelength and the Raman peak depends on solvent. For example, the Raman peak of water is always located approx. 3400-3600 cm-1 lower in energy than the excitation wavelength. This means that when exciting at 350 nm the Raman peak is located around 398 nm, while exciting at 280 nm generates a Raman peak at 311 nm. Raman scattering has a rather low yield. Raman peaks are therefore only seen when the gain or slit bandwidth of the instrument is increased to compensate for low fluorescence signals. Raman peaks are most optimally removed from emission spectra by measuring the proper emission background using a sample with pure solvent. 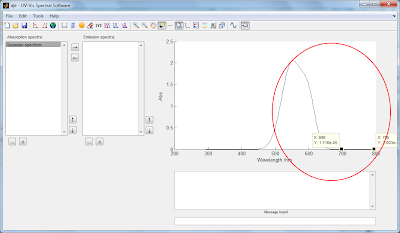 The background spectrum must be acquired using the exact same settings as the sample, i.e. same gain, excitation wavelength, slit bandwidths and preferably even the same cuvette. The background is then subtracted from the recorded emission spectrum using the background subtraction tool in a|e. If the background for some reason was not acquired successfully, setting part of a recorded spectrum to a straight line can be useful in order to remove a known Raman peak from an emission spectrum, provided the Raman peak and emission spectrum do not overlap greatly. In this example we will use a|e to remove a Raman peak centered at 750 nm from an emission spectrum by setting the spectral region to a straight line. The spectrum used in this example was created synthetically using the 'Create Gaussian spectrum' tool. 1. Use the data cursor to select the left and right boundaries of the spectral region. 2. 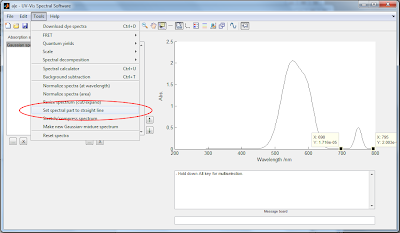 Go to Tools->'Set spectral part to straight line'. The region in between the two data cursors is now fitted to a straight line, removing the Raman peak from the recorded spectrum.